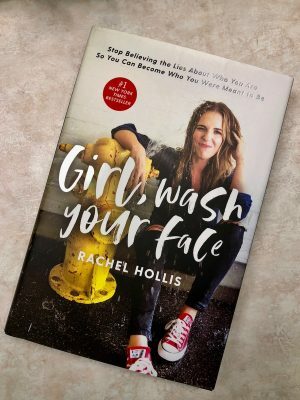 A few days ago I finished one of the best books I’ve read in a long time: “Girl, Wash Your Face” by Rachel Hollis. As soon as I was finished I knew I had to let my readers know about it. And a big shout out to my BFF, Donna Gauntlett, for telling me about this book. Author Rachel Hollis is an event planner, blogger, best selling author and all around powerhouse entrepreneur. In “Girl, Wash Your Face” Rachel basically talks about the lies we tell ourselves as women and how we can let them go so we can become the wonderful, awesome women we are meant to be. I can tell you that there was not one chapter in this book that didn’t connect with me on some level. There were even some chapters I read 2 or 3 times (sometimes with tiny tears sliding down my cheeks), not quite believing that someone knew what I was feeling. And boy did I discover that I was still hanging onto some lies that just weren’t true. I feel a little vulnerable telling you all this because after you read the book (which I hope you will!) you may think I’m weak. But you know what? This book made me feel strong and more confident in the woman I am. Thanks Rachel! Please run (or drive or order) this book and read it as soon as it’s in your hot little hands. Will it have the same effect on you as it did me? Maybe, maybe not. But I would be surprised if you didn’t see some part of yourself as you read each chapter. And if it doesn’t resonate with you, I’m sure you will know someone that it might be perfect for but I truly think it will stay on your bookshelf. Or like me, on my bedside table where I can read and re-read it over and over. Big HUGS to everyone and hurry to the bookstore! PS – Here is a link if you want to order the book!